As we’re not thinking at MMORPGs alone, ‘economy’ wouldn’t suffice- but as we’re also looking at MMORPGs, ‘good matchmaking’ doesn’t fit, either. One thing coming close to matchmaking, however, isn’t the lfg-tool many MMORPGs offer, because it’s quite difficult to measure the skill level of MMORPG players. A good guild finder is closer to reaching this goal. Building and growing a sense of community with players of your game is important in terms of retention. If we take a look at multiplayer shooters or MOBAs, for that matter, if they offered no matchmaking at all, chances are some players might find themselves losing all the time. So the matchmaking engine tries to even out teams in terms of player skill. Unfortunately, MMORPGs have neglected that part, even though player retention is crucial to this genre and ideas were floating around. Before ESO’s release and the debate of whether it would be good to have megaservers instead of language-based servers, the devs assured us that their phasing technology would put us in the same phase as likeminded players. While this does work surprisingly good in ESO, there was also talk about social options you could check/uncheck in the games’ options. Roleplayers would check their respective boxes (german, roleplaying), players who preferred grouping, soloing or trading could do the same. I don’t know if these examples were actually provided by ZOS, but they were most certainly discussed in the german playerbase around release. As was the fact that they weren’t included from the beginning and never to show up. Basically, this would be similar to selections one would expect in a good guild finder tool- and something that could make megaservers a really great thing. In sharded games, this could work with chat channels, for instance. Wildstar and Final Fantasy XIV provide a way for likeminded players to stay connected without necessarily being in the same guild/free company. At its core, they’re chat channels, as i don’t think there’s much functionality in these features beyond chatting. However, they do make it possible to connect to other- likeminded- players outside of joining a guild. Multiplayer games already offer matchmaking systems, of course. One way they could improve giving players a way to connect would be to make teams more than a [tag] in the player name- by incorporating them into the games themselves, similar to guilds in MMORPGs. By joining a team you could make it more likely to be put in matches where your teammates play. They could also factor in the friends list of, say, Steam. In my opinion, both multiplayer titles and MMORPGs already do a lot in this regard; it’s in their interest, after all. However, there’s still room for more. Seconded. My game of choice is Counter-Strike, and having recently moved to a new country where I have no connections and not being a particularly outgoing sort, I seriously struggle in this regard. CS MM is fine, you get games, but for a game that’s all about teamwork just getting a different selection of team members each time doesn’t help you get better and doesn’t help you have fun either. 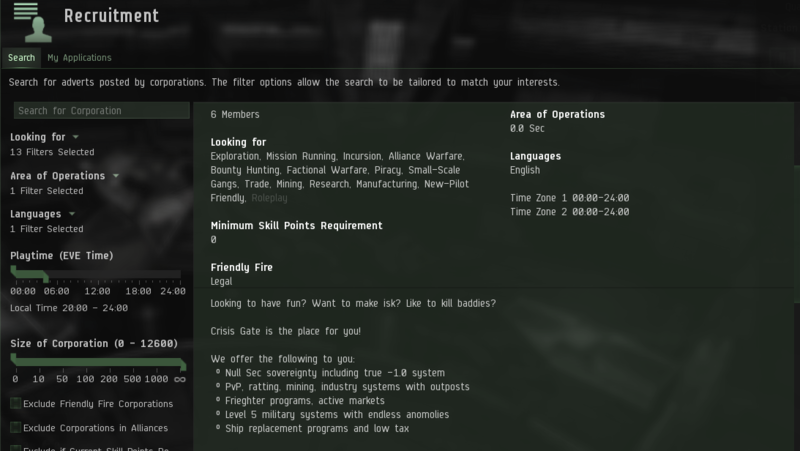 Since the game doesn’t have this feature on-board, a few competing 3rd party sites have sprung up, but most of them have horrible interfaces or focus simply on in-game roles rather than the attitude and life-outlook or availability of the players, which is what casuals like myself actually care about. One day I’ll find a team to play with, but for now I just which valve had included something with some options with the game.